Using your vehicle to advertise is a concept that has been around since February 1900 when Milton Hershey painted the Hershey brand onto a vehicle. (source) Sign painting used to be the only way to display your information. While some storefronts still use sign painting for a classic and vintage look, vehicle signs have progressed greatly. While you may occasionally see a painted logo on a vehicle, vinyl is now a far superior choice. Not only is vinyl more long-lasting than paint, it is easier to remove without damaging the existing paint job. Another thing is that when you’re painting, you’re limited to the paint colors that you have and the skill of the painter. With vinyl, we can digitally print any color, pattern, or image to be displayed. High Volt Electric came to us a couple years ago for some graphics on their door. If you’re a contractor, you definitely want to invest in vehicle advertising. If you already need to drive to customer’s locations, it definitely doesn’t hurt to advertise your business on the way. Your company information will be seen parked outside of your business, on the street, and while you’re parked at your customer’s location. 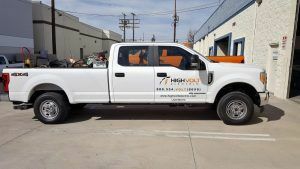 High Volt Electric came to us this year for the same vehicle graphic design we did for them previously. 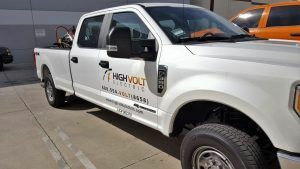 They happened to have a truck again, but if you do have another vehicle, you want to make sure that similar information is displayed and similar colors are used so your company is easily recognizable. Wraps can cover all of part of your vehicle. 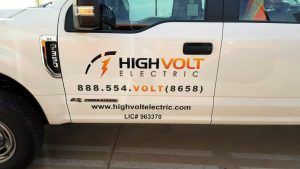 If you’re not interested in covering that much of your vehicle, you can always do spot graphics which is what High Volt Electric opted for. Spot graphics are minimal but can be very effective if done right. We can do as little as just the doors, or as much as covering the back, sides, and hood with graphics. These graphics were kept very simple and clean, displaying only the essential information. We have the logo which already gives a description of what the business offers, their contact information, and their license number. Their logo had enough color to stand out but is still very easy to read which is perfect for vehicle advertising. Check out our website to see other examples of vehicle graphics we’ve done. We also offer full wraps, partial wraps, and perforated window vinyl. If you’re ready to get started with vehicle advertising, you can request a quote here.